If someone asked you to summarize what you strive to teach your Suzuki students through the study of music, how would you respond? As Suzuki teachers, our measure of what makes an exemplary student is often different from that of our colleagues teaching in the “traditional” method; our success stories tend to center around our students’ attitudes and characteristics rather than on their technical achievements. Over the course of Suzuki study, we hope to guide our students to develop a strong sense of self-confidence, and an understanding of how to share the best of themselves with the world around them. Sometimes, we have the privilege of watching our students grow up to develop unique and personal ways of bringing their communities together through the love of music. When our students shine in this way, everyone – from the most seasoned pedagogue to the family friend who has never heard of the Suzuki method – can recognize that something truly exceptional is at work. I have always known that my student, Annmarie (age 12), illustrates the beautiful heart prized by Dr. Suzuki – you can hear it in her playing, and see it in the way she lives her life. In the four years I have known her, Annmarie has won our school’s “Practice-a-Thon” scholarship drive every year, performed at nursing homes and community events, and organized a fundraiser at her elementary school benefitting the American Red Cross. She is always looking for new ways to enrich the lives of others by sharing her love for violin, and she is not afraid to challenge herself; (in the words of her mother, Michele: “When Annmarie goes, she goes BIG.”) Of all the wonderful things she has done over the years, one event will always stay with me as an example of the power of the Suzuki method: Annmarie’s Tanglewood in the Neighborhood. Here in western Massachusetts, we have the luxury of being an hour’s drive from the Boston Symphony Orchestra’s Tanglewood Campus in Lenox. Last summer, I encouraged all of my students to attend Joshua Bell’s performance of Lalo Symphonie Espangole with the BSO – a number of them went to Tanglewood for the first time in their lives to hear him perform. Annmarie returned from the concert with photos, memorabilia (Joshua Bell autographed her rosin cloth! ), and a Big Idea. 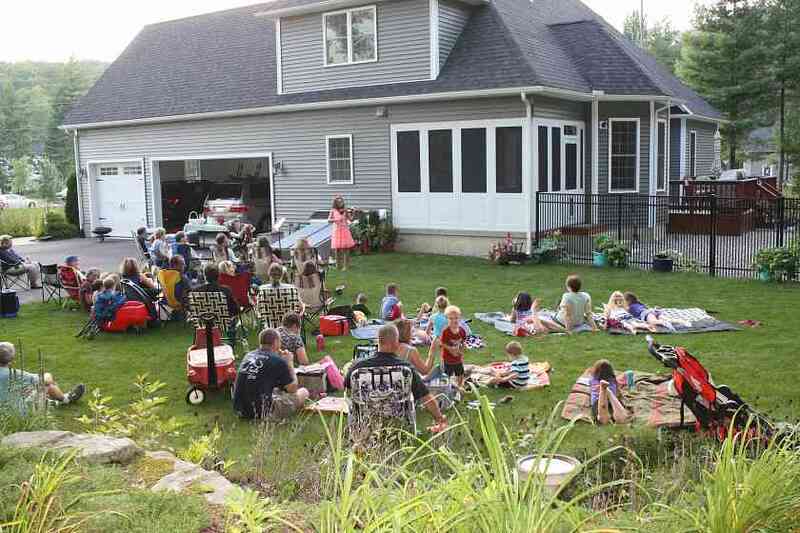 In lieu of the Book 3 graduation recital that was difficult to schedule during the summer, Annmarie asked if she could have her own Tanglewood in her front yard, inviting her friends and neighbors to bring blankets, chairs, and picnics to enjoy as she performed. I loved the idea, and gamely agreed to play the duet accompaniments in the place of the standard piano. The performance day arrived: a Friday in early September with great weather (a true blessing when planning an outdoor event in New England). As I helped Annmarie get warmed up inside her family’s house, her parents set things up outside and audience members began to arrive. We were all amazed at the number of people who came to hear the performance; a few signs Annmarie placed around the neighborhood drew friends, neighbors (some who brought guests and visiting relatives of their own), and people who lived in the area that Annmarie’s family had never met before! There were strollers, wagons, children on trikes and bicycles, and adults who brought blankets, chairs, and baskets of snacks. Annmarie’s ever-supportive parents set up a table with wine (for the older crowd), and a cooler of kid-friendly beverages. Once Annmarie arrived on the “stage”, she displayed poise beyond her years, introducing each piece and graciously thanking the audience for sharing the performance with her. As she played, parents rocked babies, friends and relatives beamed with pride, and a sense of true enjoyment emanated from an audience who might not have attended many classical music performances before. To see a neighborhood gather and experience classical music in a personal and positive way is the goal of many professional ensembles striving to innovate new ways to interact with and engage local audiences – it is truly impressive when achieved by an eleven-year-old in her front yard! After the performance ended, Annmarie took her violin and her pile of bouquets indoors, and her parents got to work on the final part of her request: a post-concert bonfire (with s’mores). As kids ran around and adults visited, it was easy to see that the event Annmarie thought to share with her community was about so much more than playing pieces for a graduation recital. 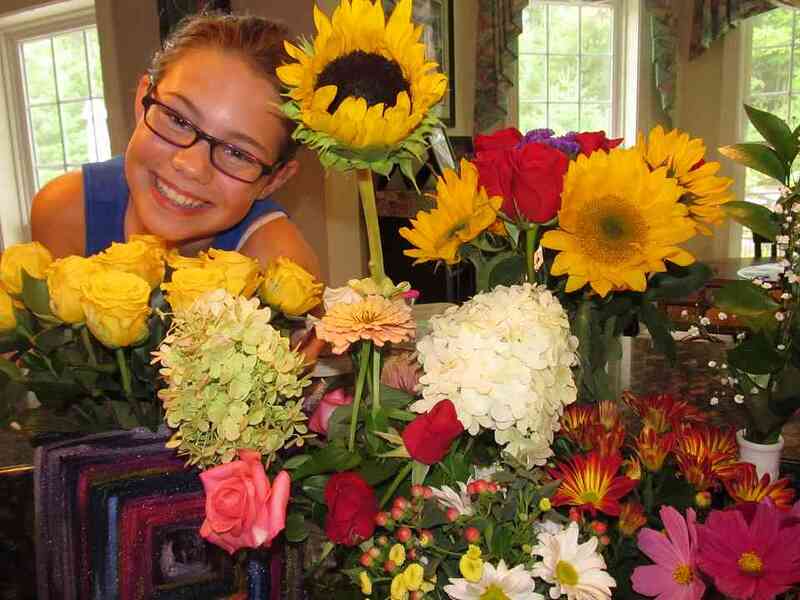 She was able to find a way to bring the joy she felt while attending Tanglewood to the people in her neighborhood, displaying creativity, great generosity, and a true enjoyment of performing in addition to excellent musical ahievement. As Suzuki teachers, we enable an individual child to value and take pride in their ability to develop a high level of skill in music, and we provide opportunities to help them learn to share their ability with others. From there, each of our students finds a way to make their music their own, and they begin to use their skills in unique and personally satisfying ways. While we may teach the same progression of repertoire countless times over the years, it is a continual adventure to see what the music we teach means to our students, and where they will take it – and us – along their journey through life.